As Managing Director, Sustainability with JLL, Jiri Skopek provides advice on energy and sustainable development in the fields of design, asset and facility management, emergency preparedness, resiliency, smart buildings and smart campuses. Fueled by the enormity and urgency of global climate change, society is being pressured to significantly reduce—in absolute terms—levels of greenhouse gas emissions. Scientists tell us that we have just a few short decades to make a wholesale switch to an entirely new energy economy not dependent on fossil fuels.1 Failure to act could result in large parts of the planet becoming uninhabitable—lacking water to sustain life, becoming submerged, or subjected to violent changes in weather and the onset of new diseases. Meanwhile, communities and corporations are affected by uncertain economies and other financial pressures. In this stressed environment, colleges and universities also face a challenge in maintaining thought leadership with respect to the environment. But if higher education does not lead the sustainability effort in society, who will? Thought leadership can translate into research and teaching of climate science and policy, and development of carbon capture and sequestration technologies and cutting edge sustainable design in buildings, vehicles, products, and industrial processes or investments to support innovation. New technological developments such as renewable energy, smart grids, and smart buildings, can help us to reduce energy consumption and environmental impacts, and potentially move into net positive rather net negative situation. The American College & University Presidents' Climate Commitment (ACUPCC)2 recognizes the unique responsibility that institutions of higher education have in training the people who will develop the social, economic, and technological solutions to reverse global warming. Another form of leadership is to model climate neutrality on the campus. Anthony D. Cortese, co-director of the ACUPCC,3 believes that colleges and universities are arguably the most important institutions to address climate disruption because they can model climate neutrality on their campuses, and they can teach their students the skills and knowledge they need to address the climate crisis. In Aristotelian tradition, this means not only talking the talk but also walking the walk. Achieving carbon neutrality is a journey that never ends and requires constant diligence. The good news: the journey isn’t as difficult as it used to be, thanks to a vast array of solutions and technologies. "Walking the talk" using existing knowledge can be as powerful as developing new technologies. Here is where the role of facilities management comes in. There are already many recognized best practices will help to reduce and eventually eliminate greenhouse gas emissions on campuses. For example, the Association for the Advancement of Sustainability in Higher Education (AASHE) provides a list of emissions reduction strategies. Engaging staff, faculty, and students is also crucial. Implementing policies such as turning off lights, not leaving water taps running, and printing on two sides conserves resources. Transportation measures include the use of alternative fuels for fleet vehicles, provision of walkable/bike-friendly campuses, and incentives to use local transit. By showing leadership in terms of eco-purchasing, selecting locally grown foods, and implementing an environmental waste management program, colleges and universities can influence a generation that considers the life-cycle environmental impact of every product they purchase, including the environmental impact associated with disposal. Each of these green campus actions is important, but addressing climate change must remain our top priority. The green steps we take embody the kind of thought leadership in colleges and universities that will influence tomorrow's decision makers, help to redefine such traditional concepts as "quality of life" and "economic growth," and culminate in a powerful movement that can literally help to save the planet. The challenge is still the implementation. We know what to do. Actually doing it is something else. There are many different factors which affect how colleges and universities move toward sustainability. The orderly, rational, logical, and planned approach we describe here may be ideal to systematically develop and implement an effective and comprehensive sustainability action plan. However, once personalities, campus culture, funding realities, organizational capacity, staffing constraints, and other idiosyncratic elements are considered, the process on any given campus may be more segmented and chaotic than envisioned here — but also potentially more creative, organic, fluid, and individualized. It is also driven by the need to capture the goodwill and harness the energy of people who are chomping at the bit to get going and accomplish something. This requires identifying and acting on some initiatives that are likely to produce quick "victories" or accomplishments, while more comprehensive sustainability action plan occur on a parallel track. Also, it is important to note that this discussion primarily defines campus sustainability in terms of campus operations and environmental sustainability, or reducing the environmental impacts of campus business functions. Campus sustainability may be defined more broadly to include the "greening" of academic, research, and public service missions. The concept of sustainability is broader than just environmental sustainability—although the latter, narrower definition is most often used by the green campus movement. The journey to sustainability and carbon neutrality begins with senior management support and a commitment to achieve ongoing stakeholder engagement. Although there is enormous potential to improve energy and environmental performance at colleges and universities, a clear mandate is needed from the university leadership to overcome inertia and resistance to change, which are natural human reactions, and to convey the importance of this initiative. Creating a multi-disciplinary steering committee for carbon neutrality can further help build a sustainable green campus culture. This is especially true when it comes to implementing certain energy-saving building operations that occupants might notice and might involve some changes to their normal habits. Examples of this would be a new policy adjusting heating and cooling temperature policies or requiring that a request be made ahead of time to have lighting and HVAC turned on in certain sections of a building on weekends. This kind of change in operations may initially be inconvenient, but it can produce significant results. For example, the University of Boston found that it could save approximately $180,000 per year for each degree of overcooling that was corrected campus-wide. That number rose to $290,000 per degree when overheating was corrected. The university estimated that even greater savings could be achieved by restricting fan run times. In the green campus realm, an appropriate long-term goal for colleges and universities is to become carbon neutral and sustainable in areas such as water, waste, resource use, and waste management. Establishing a performance baseline at the outset helps to identify "areas of concern" that may offer the greatest opportunities for improved performance toward that long-term goal. Baselining is a process of identifying the current state. It can be done using various assessment methods or gap analysis methods that are based on widely accepted key performance indicators, such as energy per square foot, water per student, and waste diversion rates, as well as a wide range of best practice operations. There are a variety of sustainability assessment tools available to facilities managers and other campus leaders. 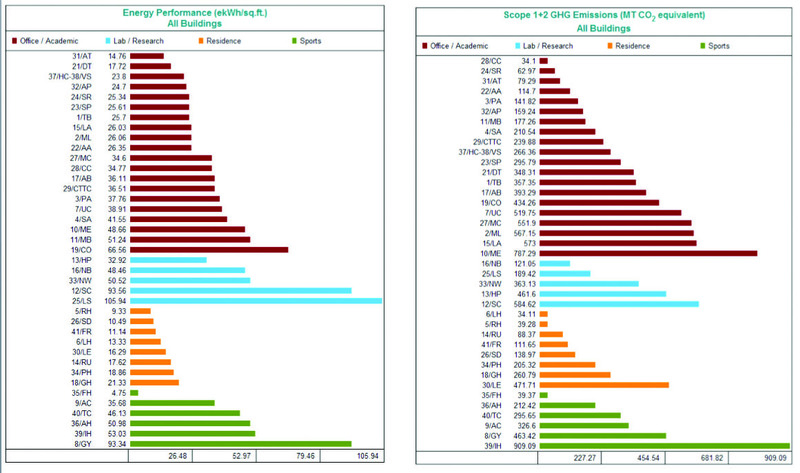 In 2013, APPA established its own campus performance assessment ESAT (Energy and Sustainability Assessment Tool). 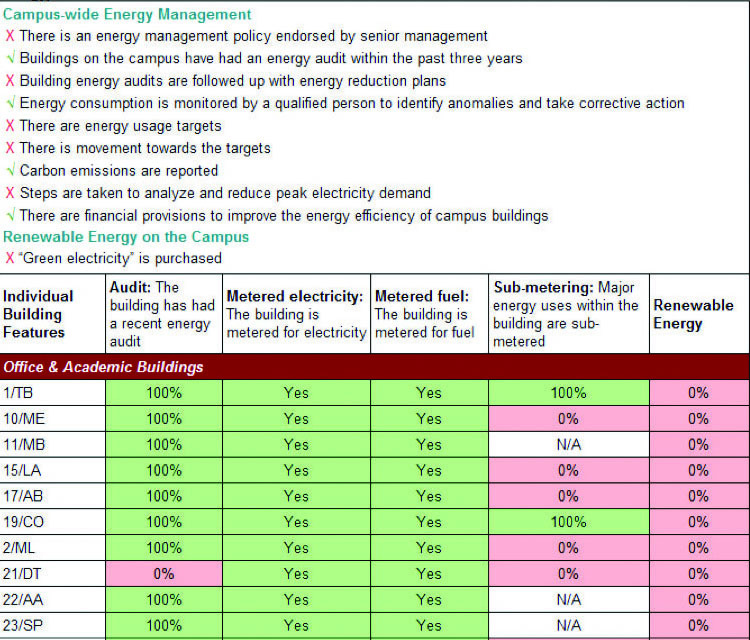 This tool provides a dynamic database that can be used to track key energy and sustainability performance indicators with respect to campus management and infrastructure as well as individual buildings. ESAT was initially developed in 2010, largely based on the efforts by Carleton University, to evaluate the entire campus portfolio of 41 main buildings. During this exercise, the facility staff at Carleton provided input to develop and test a streamlined, practical, and budget-sensitive benchmarking program, which supports a roadmap for continuous improvement for the campus. Additionally ESAT provides a data feed on a number of key energy and sustainability measures for the APPA’s Facilities Performance Indicators (FPI) Report5. AASHE’s Sustainability Tracking, Assessment & Rating System (STARS), is another system designed to provide a comprehensive evaluation of institutional sustainability by examining all facets of college and university academics, research, public service, and operations. While facilities managers may be called upon to assist with a comprehensive sustainability assessments like STARS, their focus is primarily on the facilities design, construction, and operations—hence their need for a comprehensive sustainability assessment tool that assess performance in that area. Leadership in Energy and Environmental Design—Existing Buildings (LEED EB) and Green Globes are the two most widely used green building assessment and certification methods in North America. When it comes to establishing a baseline assessment, the focus, of course, is not on obtaining a certification but rather on getting a meaningful measure of the current state of affairs. The decision to use one method or another should be based on the premises of "what gets measured gets done" and that true sustainability is driven by a culture of "top down meets bottom up." The latest trend in building assessments is to address occupants’ comfort, productivity and wellness. The ultimate objective of a building is to accommodate people safely, comfortably and in a way that helps them do their activities effectively. This takes energy for lighting, heating, cooling, moisture control, plug load, acoustics, hot water and so on. The more efficient utilization of energy, the better. The energy efficiency of a building is usually measured in terms of normalized rate of energy used per square foot. As for people’s experience in the building, this can be ascertained in either of two ways: by doing measurements, for example, temperature, lighting, humidity and air mixing etc. and/or by doing an occupant survey. An interesting question is this: at what point does reducing the amount of energy per square foot negatively impact the quality of the building’s environment for the occupants? A study by the National Center for Energy Management and Building Technologies (NCEMBT) on the relationship between a building's energy performance and the occupants' satisfaction with the indoor environment, has led to a concept called the ‘Acceptability Index Value’ (AIV). The AIV is a ratio of the energy intensity of a building relative to how occupant-friendly the building is. The intent of this ratio is to evaluate the effectiveness of energy use to achieve a specified percentage of occupant acceptability. "What gets measured gets done"
Sustainability is a function of physical attributes and human actions. Physical attributes are features of the built environment and site. Human actions include maintenance and operations procedures as well as occupant behaviors. If the strategy is to improve features, operations, and behaviors, then these are the elements that need to be measured as well as the performance outcomes. The baselining and measurement system therefore needs to benchmark against key performance indicators (for example, energy and water intensity), as well as "best practice" systems, building operations, and occupant behaviors. The measurement framework must be robust with a point system that is designed to benchmark the journey over time, rather than pinpoint a one-stop, one-time initial location or final destination. The reason for a sustainability measurement framework is not the points. The points merely demonstrate movement, and are a proxy for a host of other performance indicators, making it easy to articulate progress for a high-level audience. "Top down meets bottom up"
A campus benchmarking system should use a "top down meets bottom up" approach aimed at driving continuous improvement rather than "command and control" with the aim of obtaining a certification label. This is especially applicable for communities or large organizations such as colleges and universities. Whereas clear direction and organizational push must be provided from the top (i.e., senior management), particularly to get things rolling, a green campus culture will only be truly sustainable in the long term based on a "bottom-up" growing grass-roots movement by facilities administration, faculty, and students. To be truly sustainable, a community such as a campus needs an environmental management system that is flexible rather than rigid, provides a supportive rather than a prescriptive framework, and allows the community to develop and take ownership of solutions. It should also support universally accepted key performance indicators, while recognizing that there may be scenarios where certain operational criteria or features are "not applicable." A well-designed benchmarking framework will avoid the tendency to go "point-chasing" and, instead, take a more holistic approach with a true commitment to reducing carbon and environmental footprints. A campus benchmarking system consists of two categories of issues: those that involve the entire campus, and those that are specific to individual buildings. Examples of issues that ESAT includes in its campus-wide assessment are university policies, targets, monitoring, and communications related to energy, water, waste, resource use, purchasing, and transportation. Other campus-wide issues relate to the overall campus operations. These include regular and preventive maintenance and record keeping, site management including landscaping, use of fleet vehicles, and, in some cases, remote sensing and control of multiple buildings. Campus-wide administrative functions include environmental budgets and training and communications with staff, faculty, and students. The second category of issues consists of those that need to be reviewed for each individual building. Here the criteria may vary depending on the functional requirements and features of different types of buildings, for example, residences, classrooms, administrative buildings, lab buildings, and sports facilities. Individual buildings are assessed to see whether they have features to support energy efficiency and renewable energy, water conservation, reduced emissions, effluents and pollution, and a good indoor environment. In addition, certain performance measures are taken for each building, including energy and water consumption, carbon emissions, and waste diversion. The portfolio report also provides an inventory of features and operation practices found in each building. For example, Figure 2 shows the reporting of energy operation procedures found in the buildings. In addition to the base building energy and sustainability assessment, Carleton University did an analysis of the costs for improvements and the potential savings using the ESAT-generated report. The data collected in this report would be equivalent to a Level 1 Energy Audit. The purpose of this report is to highlight specific areas that could benefit from an additional, more detailed, investment grade energy audit. It can be used for preliminary estimating of capital costs of the building improvement as well as utility savings. Figure 3 shows the Cost of Improvements and Savings Report. An engineer may conduct an on-site investigation of building envelope, lighting systems and control and plug load, heating/cooling plant and HVAC and domestic and process (cleaning) hot water, in addition to a review of monthly utility bills for electricity, fuel and water. The assessment should also “red flag” specific energy features that are likely to be causing excessive energy consumption and provides for the entry of an order of magnitude estimate of potential savings. Where capital improvements appear necessary, an investment grade audit is recommended for those specific initiatives, which provides definitive values for costs, savings, and return on investment. Funding energy conservation investments is a challenge at most institutions. A possible solution may lie in capital planning, for better-maintained buildings tend to have smaller carbon footprints. Next Step in the Evolution of High Performance--"Smart Buildings"
Systems talking to other systems and sharing data between multiple devices — this is the basic principle of building intelligence. Sensors (now, often wireless) and the high-capacity computing power of the cloud enable a smart system to collect and analyze information from millions of data points feeding into the system each minute. For example, smart windows that lighten or darken, and open or shut depending on data about sunlight intensity and temperature, can network with HVAC and lighting controls, achieving energy savings for cooling and lighting. Smart building systems provide the operator and occupant with an environment that is flexible, effective, comfortable, and secure through the use of integrated and detailed sensing, monitoring, and controls. Smart buildings are often more energy efficient and more comfortable because of systems that make it possible to more precisely regulate heating, air-conditioning, lighting, and other environmental variables. The following are some examples that indicate how smart building technologies can achieve high performance and improved efficiencies. Instead of having just one thermostat for an entire office building or for individual floors, as is typical in most buildings, a smart building network of sensors and controls can help to deliver just enough heat, air, or cooling exactly when and where it's needed. Smart building sensors can monitor the amount of sunlight coming into a room and adjust indoor lighting accordingly. Based on key-swipe technology from the security system, a smart building can sense who is in the building after hours and turn on the appropriate lights, equipment, and environmental controls. Consolidated and centralized monitoring capability makes it possible to control many buildings from one site, maximizing efficient operation while streamlining staffing. As smart building systems demonstrate that they can effectively address energy and other resource and operational efficiencies, they will emerge as a key factor that differentiates high-performing buildings in the marketplace. An earlier example of a tool that assesses and guides the implementation of building intelligence capabilities is the Continental Automated Buildings Association (CABA) Building Intelligence Quotient (BIQ) tool. This program may be useful for colleges and universities that are interested in evaluating how smart their buildings are in terms of systems overview, power distribution, voice and data systems, connectivity options, and subsystem operations. The latest development in the creation of a smart building standard and performance assessment is being undertaken by Telecommunication Industry Association (TIA), which is in a process of creating a smart building standard. Space allocation: a space allocation study examines the amount of time that classrooms and other facilities are being used and ways to make better use of them in order to reduce the amount of space that is not being fully utilized but still must be heated/cooled and lighted. A growing number of institutions are implementing web-based energy monitoring systems that track campus building portfolio utility billing data and provide meter/sub-meter data for electricity, heating (natural gas, steam, hot water), and cooling (chilled water, electricity), either from the campus real time metering infrastructure or the local distribution companies. The data are often stored in the “cloud.” This advanced digital memory and data storage is part of the “big data” revolution. Linking to the BAS, smart building software can now generate algorithms in real time that indicate when building temperature, cooling, and energy use are straying from benchmarks. These can identify and diagnose trends and patterns in the data, indicating possible equipment or operational issues. The data can be sent to a Command Center with capability of managing of the buildings from remote servers. Such systems can also enable ongoing commissioning, which is the key to unlocking further energy savings and achieving carbon reduction. A smart (intelligent) building provides the operator and occupant with an environment that is flexible, effective, comfortable, and secure through the use of integrated and detailed sensing, monitoring, and controls. Smart buildings are often more energy efficient and more comfortable because of systems that make it possible to more precisely regulate heating, air-conditioning, lighting, and other environmental variables. 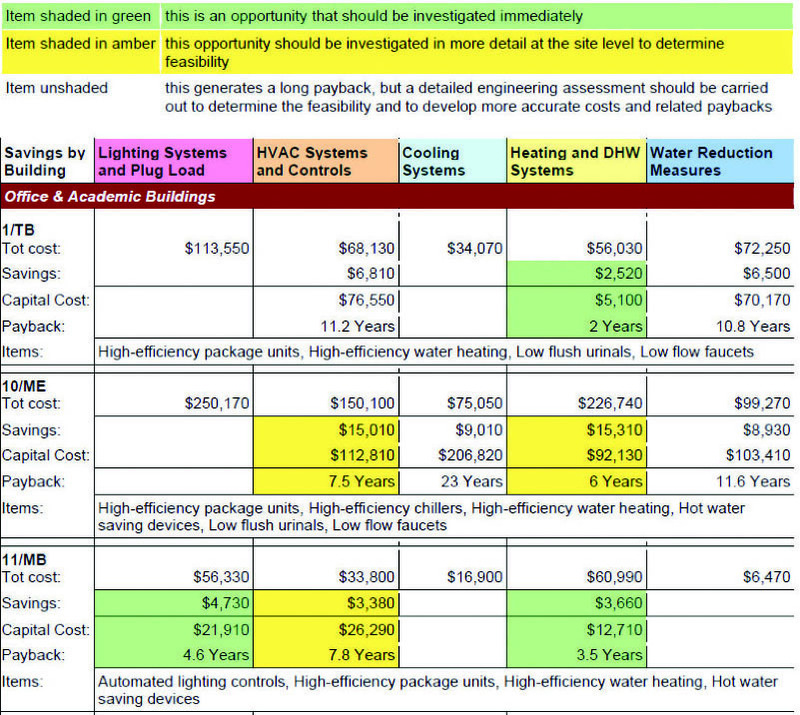 When it comes to cost savings, smart building technology offers some of the best returns on investment, with as little as a one or two year payback through energy savings from heating cooling and lighting and through operational efficiencies related to fault detection and diagnostics, maintenance, waste management, security, tracking of building occupancy and way-finding. The following are some examples that indicate how smart building technologies can achieve high performance and improved efficiencies. Some buildings use cool outside air or ‘free-cooling’ to reduce the amount of air conditioning that needs to run. If the dampers that allow the cool air to enter are inadvertently stuck in a closed position, then the free cooling may not be working at all —without anyone being aware of it. Without the free-cooling, the air conditioning may be using far more energy than needed, even though the occupants may not feel the difference. Or air handling unit can be operating 24/7 due to a faulty thermostat. Without fault detection this condition could go undetected for months. Based on card access technology through the security system, a smart building can sense who is in the building after hours and turn on the appropriate lights, equipment, and environmental controls. Renewable energy sources can complement other strategies to eliminate the carbon emission deficit once other energy-saving measures have been implemented. The cost of renewables is falling dramatically in many areas and, in some locations, is now on par with the cost of conventional energy sources. As on-site renewable energy such as solar panels become more affordable, smart buildings also have a growing role in terms of energy reliability and resilience. Interconnected buildings that have renewable power generation and smart building functionality can provide a micro-grid that offers greater reliability. As smart building systems demonstrate that they can effectively address energy and other resource and operational efficiencies, they will emerge as a key factor that differentiates high-performing buildings. An example of a tool that assesses and guides the implementation of building intelligence capabilities is the Continental Automated Buildings Association (CABA) Building Intelligence Quotient (BIQ) tool. This program may be useful for colleges and universities that are interested in evaluating the intelligence of their buildings should examine a systems overview, power distribution, voice and data systems, connectivity options, and subsystem operations. Space utilization based on a space allocation study examines the amount of time that classrooms and other facilities are being used and ways to make better use of them in order to reduce the amount of space that is not being fully utilized but still must be heated/cooled and lighted. Implementing energy-efficiency measures can also result in reducing GHG emissions from the production of electricity, and in the burning of fossil fuels associated with building heating systems. The ESAT tool provides current energy-use values, estimated energy savings, and the resulting reduction in GHG emissions that could be achieved through implementation of an energy-optimization program. The baseline serves as a snapshot of what currently exists, and should provide some indication of the areas that could potentially be improved. However, before developing detailed action plans, it is helpful to have a sense of the general direction and degree of commitment, as well as some goals and objectives, which provide the basis for developing performance indicators and targets. If the university does not already have a vision for sustainability, it is a good idea to undertake a charrette or facilitated workshop with the appropriate stakeholders to develop one. A long-term vision is not a frivolity but an essential part of developing a strategy, necessary to shape the general direction of your path toward sustainability and carbon neutrality. Traditionally, vision statements express goals in the form of qualities and desires including, where possible and practical, actions or goals. Although it is not necessary to quantify issues in the vision itself, it is helpful if they are expressed in a way that could be quantified at some stage. Goals need to be established by a sustainability steering committee, which includes representation by facilities management administrators and is strongly supported by upper administration. The goals should be based on a clear understanding of what is desired and realistically achievable for the university, and should be aimed at turning the vision into actions that lead to a positive change. The overarching sustainability goals of most college and university operations are to reduce GHG emissions and other environmental impacts, demonstrate environmental leadership, and reduce costs. Review data and identify "areas of concern"
A review of the data will help to prioritize areas of low performance that appear to be the most urgent and/or important. These can be articulated in a list of "problem statements" that are drawn from an analysis of the data and a synthesis of the findings. Data can take many forms, including quantitative as well as qualitative findings from partial or comprehensive environmental and energy audits. Where possible, these audits should involve students, faculty, and staff, and not simply be conducted by facilities staff. Objectives: (1) Reduce electrical use in existing buildings on the campus, and (2) ensure that all new construction is as energy efficient and reliant on solar or other carbon-free energy resources when possible. However, each university may also have its own specific objectives that relate to specific areas of concern—for example, reduce electrical demand from some specific buildings that are "energy hogs." The next step is to "quantify the vision" by setting indicators. The indicators will also serve to measure whether the chosen strategies are achieving the goals and objectives. A number of commonly accepted indicators relate to broad objectives. In addition, a university may want to establish more granularity based on an analysis of trends, anomalies, and areas of concern, for example, "amount of energy that is used in residences" or "percentage of students who bicycle to school." Each indicator should be scientifically valid and demonstrate a meaningful link between cause and effect. For example, measuring the electricity used by academic buildings for cooling could provide an indicator that is directly linked to raising temperature settings or reducing fan run times. The indicators should be meaningful to facilities management administrators and expressed in language that is understandable by the intended audience. It is also important to consider the availability, ease, and cost of collecting the data needed to address each indicator. The steering committee, or its energy conservation subcommittee, should then establish targets based on the baseline condition, observed trends, and current and predicted technologies, as well as technological, social, or economic constraints. Some targets may be set using a contractual approach, for example, with a policy that a given area can be developed only in a sustainable manner with significant monitoring. Although target setting must be tempered by reality, the tendency to set easy targets should be avoided. It is important that targets be aggressive enough to challenge the campus to take significant steps toward sustainability and carbon neutrality. The steering committee, when it is actively involved in the details of this kind of target setting, should consult facilities management administrators to establish targets that are really challenging but possible. Establishing policies is important because policies formalize and strengthen commitments and empower those who are charged with achieving them. Where targets are significant and where achieving them is more likely if they are backed by a policy endorsed by the upper administration, the steering committee should propose that they become a matter of official campus policy. Of course, campus environmental policies can be broad or narrow. Recycling targets can be embodied in a campus recycling policy. Heating and cooling season temperature policies can be incorporated into a campus temperature policy. In addition, the steering committee may wish to develop and propose to upper administration an overarching campus environmental policy that establishes a strong institutional commitment to achieving broad environmental sustainability goals over time. Some, but not all, of the campus residences have high energy-intensity values. Windows are often open in some buildings in the winter. Some areas in certain academic buildings lack lighting controls. Certain buildings are producing an excessive amount of solid waste that appears to be due to some specific activities. A large number of classrooms are empty at least half the time. Some buildings appear to be heating and cooling at the same time. A large amount of water is being used for irrigation. HVAC and lighting operate seven days a week in certain buildings. Some of the issues may be related. In consultation with the facilities management administrators, the probable root causes of each issue need to be identified as well as any threads that may link them. As the observations and problem statements are categorized, the steering committee, or its appropriate subcommittee, will gradually distil the list to primary, secondary, and tertiary priorities that will become the basis for the strategic action plan, which will in turn, inform specific targeted activities. The purpose of developing the action plan is to achieve broad-brush strategies to address key problem areas with a primary focus on the goals of the college or university. From the strategic action plan, programs and projects will emerge that focus on specific issues. An effective approach to develop the actual programs and projects is to first conduct a brainstorming session to propose a number of options. Before the meeting, each member should have a comprehensive briefing package that includes the action plan with goals, objectives, and targets, as well as a menu of best practices and some of the areas of concern that have been identified using the baseline data. The next step is to evaluate the proposed measures using a "STAPLEE9," a cost/benefit evaluation framework. STAPLEE stands for Social and academic impact, Technical feasibility, Administrative feasibility, Political will, Legal authority, Economic viability, and Environmental impact. On the basis of this evaluation, a final list of proposed measures can be identified. Social and academic impact: This is an examination of the potential disruption on academic quality and compatibility with present and future cultural values of the university. Technical feasibility: This is a high-level assessment of technical feasibility including the short-, medium-, and long-term effectiveness of the proposed measure, the possibility that the measure may create additional problems, and the question of whether the proposed measure is a whole or partial solution, or not worth considering at all. Administrative feasibility: This is a high-level assessment of each potential measure in consultation with those who would be responsible for the implementation and operation. For example, are there sufficient staff and other resources to implement a used furniture recycling program? Political will: For each potential measure, is there the "political will," including support of a local, influential champion who is willing to help see the action to completion? Is the proposed measure in line with the attitudes of current university leadership? Legal authority: For each potential measure, are there legal issues? Does the university have the authority to mandate the action? Are there liability issues or possible legal challenges? Without the appropriate legal authority, the action cannot lawfully be undertaken. Economic feasibility: This is a high-level assessment of economic issues, including cost, how the action contributes to the university's economic goals, sources of funding, and the possibility of beginning some parts of the project and deferring others. Cost-effective actions that can be funded in current or upcoming budget cycles are much more likely to be implemented than those that would incur long-term debt to a community. Environmental impact: This is a high-level assessment of the environmental issues, including energy and GHG emissions reduced, effect on land, water, impact on biodiversity, compliance with environmental policies, and consistency with the community’s environmental goals. For each objective, the Steering Committee should draft a table listing all the proposed activities, and for each proposed activity, the STAPLEE findings. There are clearly preferred actions that will meet the objective. In this situation, the steering committee is likely to recommend these actions. A low-cost action is identified that can be implemented in the short term but that is not as effective or desirable as another action that requires significant resources. A recommendation may be to select both the inexpensive option for the short term and the other as a long-term action. An action has been identified that is possible to accomplish, but is not desirable from the viewpoint of a portion of the community, whereas another less objectionable alternative action requires the acquisition of significant resources. A recommendation may be to select the alternative that best reflects the will of the community. Several actions seem technically feasible and acceptable but more data are needed to determine which is most appropriate. It may be helpful to review the original objective in order to select the best solution. Where ambivalence remains, the steering committee may recommend further study to determine the most appropriate alternative. Funding: Some actions may be low cost, or eligible for immediate funding; for example, measures that are eligible for government grants. Ease of implementation: Actions that are easily implemented and/or are eligible for funding have the added benefit of being able to demonstrate early success. For example, sealing gaps around doors and other apertures can reduce energy loss. Time: Similarly, one way to demonstrate immediate progress might be to start with actions that are quickly accomplished rather those that would take a long time to obtain approvals or community support. Installing daylight sensors or timers on stadium lights precludes their blazing in full daylight, resulting in immediate savings. Multiobjective actions: Some actions achieve multiple community objectives. For example, better HVAC controls can improve comfort and productivity, avoid students opening windows in the heating and cooling season, avoid heating and cooling the building at the same time, and result in improved energy efficiency, energy cost savings, and reduced GHG emissions. The action plan should reflect a continuum of goals over the short and medium term, and should also be able to accommodate realistic long-term goals. For example, solar energy may be more desirable, but if it is currently too expensive, or if it requires the development of a more efficient infrastructure, then it may be necessary to continue to use fossil fuel while also establishing building guidelines for the conversion of buildings and reconnection to a solar-based system as it becomes available. As the economic situation becomes more sustainable, medium-term goals could be implemented to slowly introduce solar technologies through the replacement of old fossil fuel infrastructure, and so on. What will it achieve (objective)? When will results of this project be seen, i.e., in the short term (less than 1 year); mid-term (2 to 3 years), or long term (more than 4 years)? What will it take to make the project a reality in terms of technical assistance, senior management support, type of equipment and materials, and skills and expertise? What are the financial considerations, including funding high-level estimate, investment, the order of magnitude of costs (e.g., no/low costs, large investment/long-term payback, small investment/quick payback), and what are the funding sources? What are the main obstacles likely to be and what tactics can be used to overcome them? What metrics will be used to measure how the project will meet the goals and objectives? Whereas the Action Plan was developed based on general macro-data, selecting project options requires a more detailed assessment. As previously indicated, there is no cookie-cutter prescription for campuses. Nevertheless, certain measures are helpful in the implementation. A campus energy program needs a clear ongoing commitment from campus leadership—not only to kick-start it but to keep it rolling. College and university chancellors, presidents, provosts, and chief business officers can inspire and insist that their campus communities support energy conservation, recycling, and other operations-oriented environmental efforts. Marketing the energy or sustainability efforts by demonstrating an environmental commitment and steady progress, as evidenced through improved scores on AASHE's STARS or other rating system, can also help to maintain top-level support, as this can be viewed as a way to attract and retain students as well as faculty. Colleges and universities are in the business of rating performance and achievements and it is past time that those activities include environmental sustainability. The operator of campus facilities has the greatest opportunity and ability to save energy as well as to initiate and manage other important environmental programs like recycling. For this reason, it is essential that campus leadership reinforce the mandate and empower facilities management to perform this job to the best of their ability. Senior management needs to show public support for the energy conservation program and the facilities staff who are behind it. This is because the early phases of implementation could involve some initial inconvenience or discomfort. For example, as facilities operators refine temperature settings and fan operating hours, they need to have room to "push the envelope" and risk complaint calls. Campus leadership must empower facilities management to perform this job, allowing them to hold the line when unreasonable calls come in demanding the heating or air-conditioning be turned up—while communicating to employees and students that energy conservation is a top priority. Raising awareness is an essential component of an effective campus sustainable energy and environmental program. There are any number of small, everyday actions, from switching off lights and electric appliances and turning down thermostats, to not leaving taps running, which, when carried out by all staff, faculty, and students, can have a significant impact on the amount of energy and resources being consumed. Conservation habits, customs, and ground rules reflect an enhanced environmental consciousness that can become part of a campus culture. Once these resource-conscious actions become a habit in the workplace, they are likely to carry over into the personal lives of employees. Because people and organizations are creatures of habit, and changing habits is much harder than changing structures or systems, there needs to be a well-defined strategy for involvement and a measurable action plan for each objective. On a busy campus, raising energy awareness may be difficult because it is hard to get people's attention. Thus, a variety of methods and media are required. The basics include an attractive, well-linked, and well-used Web site; e-mail notices; campus articles in on- and off-campus newspapers; posters; stickers; and classroom presentations. Creativity and persistence are key to an effective awareness program that will speak to the minds and hearts of students, faculty, and staff. Yet all of this will be for naught if facilities management is not viewed as doing its job. If we want students, faculty, and staff to participate in a campus environmental program, it must be clear to them that facilities management is doing its part and is sincerely trying to get temperature settings right, provide recycling bins where needed, and in other ways support the environmental program. Strong leadership from senior management and a public relations campaign backed by a clear facilities commitment to environmentally responsible facilities operations are essential to change the campus culture and create a climate for conservation. Not only does this foster support for campus conservation efforts, but it also contributes to thought leadership and eco-literacy of graduates. The result is a culture where people are upset by energy waste and want to report it and stop it—where people worry less about having to wear a sweater to school, and complain more about a door that is stuck open in the middle of winter, or stadium lights that are blazing away during daylight hours. The basis for change is strong corporate communications, messaging, and accountability. In the beginning, this may consist of a message from senior management, which not only speaks to values but also specifies action. This may be a new policy announcement and it should be followed by a plan of implementation and measurement. "The amount of paper used on the campus computing sites continues to increase dramatically. Our university prints, single-sided, 7.4 million sheets per year. A recent study at a number of our printing sites showed that one quarter of the paper that is printed ends up in the trash or recycling bins. Staff, faculty, and students can make a contribution to help the environment by reducing the amount of paper that is needlessly printed. Our campus "Wiseprint Program" is designed to help reduce paper usage and the subsequent waste it generates. By providing information on how to print more efficiently, we want to make it an easy choice for you to print conservatively, thus decreasing the impact of excessive paper use on the environment. For example, the amount of paper that could be saved by printing double-sided—even considering that some documents must be printed single-sided—is 2.5 million sheets." "Our new campus policy is to reduce the amount of paper that is wasted through needless printing and single-sided printing. We ask all staff, faculty, and students to help us meet our objective to reduce the annual amount of paper used in printing in one year by 30 percent." "All printing sites now have printers that will have as their default setting, to print on two sides of a sheet of paper. However, realizing that you may have to print some document on one side only, you will have the choice to select single-sided printing. Other measures that we encourage you to adopt include printing only what you need. For example, if you need only one page of a document, do not print the entire document. When creating a document, use the Print Preview feature to avoid printing many drafts..."
"Each department will measure and report on how much paper is purchased between October 2009 and October 2010 and estimate based on past consumption levels how much has not been used." In the case of reducing waste and the environmental impact associated with printing, senior management could also indicate in its communications that it has decided to switch all campus paper use to 100 percent post-consumer content recycled paper. That step would not only produce additional environmental benefits but it would also demonstrate institutional seriousness about paper that will further encourage students and faculty to print less. Whatever the issue may be, the above example shows how a combination of communications from senior management, an implementation plan, and performance measurement can replace old engrained habits—putting them at odds with the new, more enlightened campus culture. Outreach should be audience specific, recognizing differences in outlook, opportunity, and motivation to act and participate. Most commuting students, faculty, and staff can turn off lights when leaving a room. Some have access to thermostats. But their opportunities to actively and directly save energy are limited compared with those who reside in campus dormitories or apartments. Both audiences need to be reached but each requires a different approach and different materials. Every campus has its "energy pigs"—buildings or types of systems that are particularly wasteful. These significant sources of energy waste should be identified and targeted as priorities for campus conservation efforts. Correcting them is like striking gold. Some measures that a have rapid payback are seductive. For example, lighting retrofits can have an attractive payback, especially on campuses that have lots of incandescent bulbs or older-style fluorescent lighting. However, while exclusively targeting quick payback measures is tempting, project managers should avoid this fast payback trap and are well advised to do short and long payback measures together so that their combined paybacks are attractive, and in the end, more measures are installed. If all the "low-hanging fruit" is done first, much of the higher hanging fruit (projects with longer paybacks) may be unreachable. Most colleges and universities have seen an explosion of electronic devices and computer use in the past 20 years. Coincident with this development is higher energy use—sometimes referred to as "load creep." An average desktop computer uses between 60 and 300 watts. 150-watt personal computer system (CPU, monitor, and printer) may use 1,314 kilowatt hours per year if left on continuously. The energy needed is equivalent to 1,000 lbs of coal or 100 gallons of oil, and energy cost is in the order of magnitude of $100. If a university has many thousands of computers, the energy and dollar cost for the plug load is enormous, not to mention the air-conditioning needed to remove the heat that is generated. To reverse the wasteful habit of leaving computers running, a policy must require that new computers be Energy Star compliant, that all computers be switched off at night (unless needed for ongoing research), and that computers are enabled to use a low-energy sleep mode when not actively in use during the day. Some campus energy programs are doomed from the start by financial disincentives. Campus administrators and planners need to identify and remove these barriers to conservation. One disincentive is the "use it or lose it" approach, whereby any savings achieved by energy conservation efforts result in a smaller budget in the next cycle. This is often seen on multicampus university systems or on campuses where individual departments are charged for their energy use. Other disincentives are at work where campus real estate is rented to research institutes, food services, vending machine operators, campus apartments, or dormitories with a fixed charge for energy and other utilities and thus no financial incentive to use less and be efficient. New approaches are required to eliminate these disincentives and find ways to incentivize good behavior. If staff, technical expertise, or money are not available to adequately and quickly advance an energy program, campus managers should consider employing the services of an energy service company (ESCO). An ESCO is a business that develops, designs, installs, and may finance energy conservation and efficiency projects. An ESCO can implement large energy projects that produce positive cash flow and pay for themselves. No up-front dollars are needed. Projects can be structured in different ways to suit campus needs, desire for involvement, and risk tolerance. Contracts may be "fixed cost" or "cost-plus," with or without a "guaranteed savings" provision. Cost-plus projects without guaranteed savings can produce the most benefit at the least cost but require substantial campus involvement. In many parts of North America, it is now possible to buy electricity in a deregulated marketplace. The danger is that the cheapest electricity may be the dirtiest. A campus energy program may lose its focus and prioritize shopping for cheap energy over aggressively pursuing energy conservation. Both activities can save energy dollars and both activities often fall to energy managers. But of the two tasks, only energy conservation preserves natural resources, cleans the air, reduces GHG emissions, and produces other environmental benefits. The bright side of deregulation is that it can provide customers with the ability to choose a green power supplier. Purchasing clean, renewable electricity from wind power, low-impact hydro, or sustainable biomass can help reduce your campus environmental and carbon footprints—although care must be taken to ensure that green power purchases actually produce more green power generation and thus really displace dirtier fossil-fuel–based power. This can be accomplished by engaging in a long-term contract with, for example, a wind farm developer who is planning but has not yet built the next wind farm. The last component of a successful campus sustainable energy program is documenting what has been done. What projects have been completed and what has been accomplished? In the case of energy, how much energy has been saved in energy units (MCF, gallons, tons, BTUs, kWh, etc.) and in energy dollars? How much fossil fuel energy has been replaced by clean green power? What are the environmental benefits in terms of reduced air pollution and greenhouse gas emissions? In the case of solid waste and recycling, how much has solid waste tonnage been reduced and how much has the recycling rate improved? As the projects are implemented, the university will need to undertake periodic reviews of the progress and keep staff, faculty, and students aware of what is happening. The indicators will measure how the projects advance the university toward achievement of its goals and objectives. The indicators will largely relate to elements of the baseline data set, for example, "amount of energy that is used by existing residences" and "number of passengers that use public transport." The regular measurement against indicators, when compared with the baseline condition, will highlight improvements (or problems) caused by decisions and actions taken and may even be useful in comparing current practice against similar communities elsewhere. To provide an overview of the improvements, the campus should undergo an annual re-assessment; for example, using the ESAT and/or other evaluative tools such has AASHE's STARS. At a basic operational level, addressing energy sustainability and climate change can help colleges and universities operate more efficiently and effectively and gain competitive advantage over institutions that choose to wait. In many cases, campuses are generating cost savings from their initial efforts. Planning for sustainability can also help stabilize long-term operating costs, increase capacity for long-range planning, and put postsecondary institutions ahead of the regulatory curve by anticipating state, provincial, and regional energy and carbon mandates. Hundreds of colleges and universities are already reaping significant benefits by demonstrating leadership in implementing sustainability and climate change initiatives as these issues take on added urgency. Bardaglio, Peter and Andrea Putman. 2009. Boldly Sustainable: Hope and Opportunity for Higher Education in the Age of Climate Change. NACUBO. Barlett, Peggy F. and Geoffrey W. Chase. 2004. Sustainability on Campus: Stories and Strategies for Change. MIT Press. Creighton, Sarah Hammond. 1998. Greening the Ivory Tower: Improving the Environmental Track Record of Universities, Colleges, and Other Institutions. MIT Press. Eagan, David J., Terry Calhoun, Justin Schott, and Praween Dayananda. 2008. Guide to Campus Climate Action Planning; Pathways to a Low-Carbon Campus. National Wildlife Federation Campus Ecology Program. Hignite, Karla. 2009. Educational Facilities Professional's Practical Guide to Reducing the Campus Carbon Footprint. APPA. Simpson, Walter. 2009. Cool Campus! A How-To Guide for College and University Climate Action Planning. AASHE. Simpson, Walter., ed. 2008. The Green Campus: Meeting the Challenge of Environmental Sustainability, APPA.